Heat oven to 400 degrees. Cut apples in half; cut out and discard core, seeds, and stems. Place ¼ cup of the apple juice in an 8-inch baking dish or casserole. Place apples cut side down over juice. Bake 15 to 18 minutes or until apples are tender. Meanwhile, simmer remaining 1 cup apple juice in a small saucepan over medium-high heat 5 minutes. Add cherries and cloves; reduce heat and simmer uncovered 10 minutes, or until cherries are plumped, stirring occasionally. Remove from heat; stir in citrus sections. Arrange apple halves cut sides up on serving dishes. Pour any remaining liquid from dish into cherry mixture and spoon the mixture over apples. Garnish with mint sprigs, if desired. A little ground clove goes a long way—its zippiness is a perfect complement to this fall/winter dessert. Try studding each apple with 2 whole cloves, so that they are submerged in the apple juice as the apples bake. Remove the clove before eating the apple, which will now be scented with zingy spice. This is an early summer treat as that is when cherries are at their best. Dried cranberries may replace the cherries. 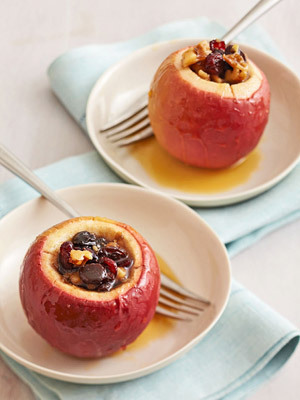 Baking apples cook more quickly and develop a softer texture when baked than eating apples. McIntosh apples are another good choice for this recipe.